Legwarmers, dance wraps and shrugs, knit shorts, cover ups and more. Polyester/Spandex fuzzy legwarmers by Eurotard. 12"
The Contrast Trim Leg Warmer by Eurotard is sure to warm up your little dancer! Stirrup thigh warmers are 100% acrylic and can be worn over/under slippers or shoes. Children's 55% Acrylic, 45% Cotton leg warmers are the perfect accessory for dance class. Layer them over tights and shoes to keep calves and ankles warm before, during or after class. Adult patterned leg warmers are made of 74% Acrylic, 24% Polyamide, and 2% Spandex to ensure fit and hold. Layer over tights and shoes to keep calves and ankles warm before, during or after class. 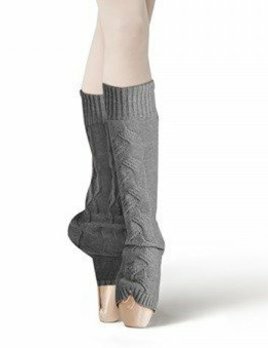 Bloch's adult 100% Cotton leg warmers complete the dancer's warm-up look. Layer over tights and shoes to keep calves and ankles warm before, during or after class.